Believe me, my skin NEEDS me to do me. After going on 10+ preschool tours, back-to-school shopping, etc., #MasqueSundays fell on my priority list, and consequently my chin (my worst problem area) is breaking out like crazy with lots of little bumps and one deep cystic pimple. So I am busting out JustNeem's Neem Clay Mask, which is made with French clay, neem oil, and other beneficial oils, to hopefully calm my current breakouts, and stop any future ones. What is a Neem Tree and Neem Oil? Neem oil comes from the neem tree, which has been used for centuries in Ayurvedic medicine for its anti-inflammatory and anti-bacterial qualities. 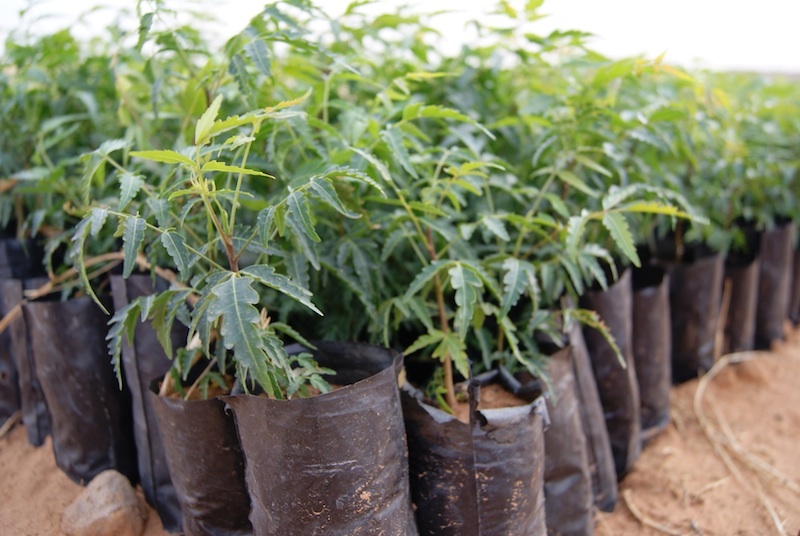 JustNeem partnered with African farmers in a program to not only cultivate neem trees, but also stimulate the local Mauritanian economy. Neem Oil has many skin care benefits because of its extraordinarily high levels of antioxidants and carotenoids (similar to carotene), which defend the skin against aging free radicals. Neem Oil is also especially high in the all mighty fatty acids and vitamin E, so it has healing properties, too! It is also easily absorbed into the skin... without leaving skin greasy. 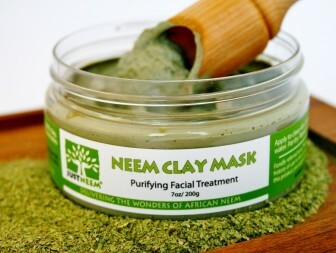 This Neem Clay Mask by JustNeem is not my first encounter with neem. If you follow me on Instagram, you may have seen pictures of my mother-in-law's lush backyard with fruits and herbs. Well, she uses neem oil as a bio-pesticide for her farming and gardening, as it repels a wide variety of pests, including aphids, ants and mosquitoes. So, when I saw Dr. Oz feature JustNeem on his show, you know I had to get my hands on JustNeem's skin care! I contacted JustNeem, and they generously sent me the famous Neem Clay Mask, and a bunch of great samples (stay posted for reviews on, the other JustNeem super star, the AcNEEM Acne Spot Treatment, Green Tea Lotion, and Coconut Soap). When my skin is super congested and dull, I look to clay masks to give me a deep cleansing. I love clay masks because they really draw out the black heads and other impurities plaguing my skin. JustNeem's Clay Mask is made out of French clay, which is rich in iron, silica, magnesium, calcium, titanium, sodium and potassium. These natural minerals found in French clay stimulate blood circulation, slush off dead skin cells, and tone and brighten the skin.The French clay base also makes this mask great for all skintypes -- normal, combination, and oily skin. It is, especially, great for acne prone individuals like myself. Additionally, the star ingredient is Neem because of its amazing antibacterial properties, so the mask is superb at fighting any acne you feel creeping up. Neem also boasts anti-inflammatory properties, so it is great at calming existing breakouts and redness. The JustNeem mask also smells refreshing and herbal thanks to the eucalypytus and peppermint. BUT, my favorite part about the mask is that is has little microbeads that really exfoliates, softens, and brightens your skin. I have not used too many clay masks that have microbeads, and I was presently surprised that the JustNeem mask incorporated them. Generally, I like to apply a thin layer of cheesecloth in between my skin and clay masks. It makes cleanup easy! If I don't have cheese cloth, I like to use a clean, damp towel to wipe off the majority of the mask, and then I rinse my face in the shower or by splashing water. I cannot recommend the JustNeem Clay Mask enough. JustNeem's mask is an example that you do not need to sacrifice quality or feel like you are are treating yourself any less to a facial at home. 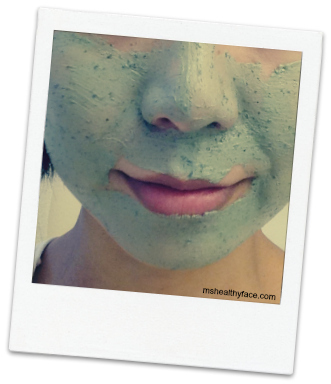 Have you tried the JustNeem Clay Mask? What is your favorite clay mask? Ingredients: Water, Montmorillonite (French Green Clay), Helianthus Annuus (Sunflower) Seed Oil, Emulsifying Wax, Glycerin, Stearic Acid, Azadirachta Indica (Neem) Leaf Powder, Phenoxyethanol, Caprylyl Glycol, Xanthan Gum, Rosmarinus Officinalis (Rosemary) Leaf Oil, Eucalyptus Globulus (Eucalyptus) Oil, Cedrus Atlantica (Cedarwood) Bark Oil, Lavandula Angustifolia (Lavender) Oil, Mentha Piperita (Peppermint) Oil. I have been working up the nerve to splurge on RMS Beauty's "Un" Cover-up. It's a "green" concealer made with coconut oil and cocoa butter, and all these other goodies. Josie Maran's Black Oil Mascara has been on my radar, too. It is paraben and phtalate free :) And honestly, who doesn't want argan oil conditioning and softening their lashes? Lastly, Anastasia Beverly Hill's Brow Wiz has been on my wish list for a whileeeee...I have been wanting to try a luxe version of my beloved, Milani Easy Brow. I will definitely be purchasing this ABH eyebrow wand my next make-up trip.